Honor today introduced Honor 7X smartphone in China which comes with 18:9 Display, Dual Rear Camera. Specs are Similar to Honor 9i which has Dual Rear & Front Camera. Check out Price, Specs, Feature comparison between Honor 7X and Honor 9i. Both Phones comes with Metal body, Fingerprint Scanner on the rear It comes with 5.93-inch (2160 x 1080 pixels) Full HD+ 18:9 2.5D curved glass display Powered by 2.36GHz Octa-Core Kirin 659 processor with MaliT830-MP2 GPU. Honor 7X comes in Black, Blue and Gold colors and is priced at Rs. 12999 for the 32GB storage version and the 64GB storage version costs Rs. 15999.Honor 9i comes in Aurora Blue, Graphite Black and Prestige Gold colors, is priced at Rs. 17,999 and will be available exclusively on Flipkart. Both have Similar Specs expect Dual Front Camera on Honor 9i which is also known as Huawei Maimang 6 in China. 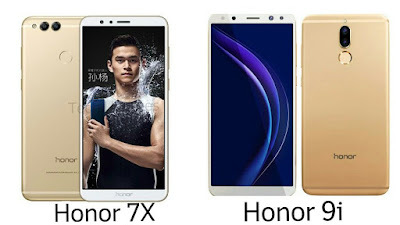 When can we expect the lauch honor 7x in india.